Check out our latest ranking of the top 10 schools for bros 2014. Bro: [br-oh] noun – A species of male ages 17-24 who can often be seen sporting a lax pinny, oversized Nike Dunks or Sperry’s, and cheap sunglasses from the 90s. They usually travel in packs officially known as fraternities, and use brocabulary like “legit” and “f*** that noise.” At a party, bros can be found icing other bros, eating brotato chips and talking about how drunk they are. Don’t get me wrong; this is not to say anything negative about bros. After all, they make us laugh and they also make us cry when they accidently spill beer on us (although I was wearing a sheer white T-shirt so I’m suspicious about the ‘accidently’). Picture this: a football stadium packed to the brim with bros dressed in green and white, shouting at the top of their lungs for their Big 10 team. Meanwhile, thousands of other bros who were too drunk to actually make it to the game are still partying in the front yards of their huge mansion fraternity homes. Tucked among the farms of East Lansing, MSU is a huge Spartan nation of about 45,000 undergrads, with at least half of those being bros. “The bros at MSU like to live young, wild and free all day, everyday,” said MSU junior Rachel Dickerman. “There is no party like a Tuesday night party for bros.” There are only two words that can totally describe these bros: Sparty on. Bros at Penn State University can often be seen around campus yelling “WE ARE” for no apparent reason. But Nittany bros know to scream “PENN STATE” at any point in time that they hear that phrase. Found in University Park, Pennsylvania, Penn State is known for its overwhelming school spirit. Bros go absolutely nuts for the school’s sporting events, and will do anything for the team. During the recent scandal involving beloved football coach Joe Paterno (need I explain? ), bros here were devastated to see him go. A very small percentage even felt the need to start a riot in support of the coach. Although this may give Penn State bros a questionable reputation, it’s important to know that most bros there will not accidentally tip a van over on top of you. The football rivalry between the Ohio State Buckeyes and the Michigan Wolverines is one of the longest standing and most intense in college history. As a result, this rivalry has created an entire population of bros. 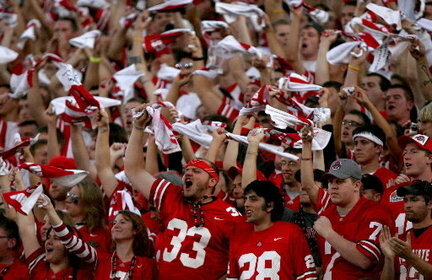 Being the third largest university in the country means that Ohio State generates more bros than almost any other school. Bro traditions here include hating the Michigan Wolverines, yelling “O-H,” and hating the Michigan Wolverines. If you’re a guy who is not involved in Greek Life at Alabama, no offense but you’re kind of a nobody. This Tuscaloosa, Alabama, school prides itself on its extremely active fraternity life. And with every fraternity comes a few southern bros. As one of the first public universities of the 19th century, Alabama has been producing young bros since 1831. Their mascot is the Crimson Tide, and if you don’t say “Roll Tide” at football games, you might as well kick yourself out of the stadium. With a mascot like the Rebels, how could there not be bros at this school? Located in Oxford, Mississippi, Ole Miss has what I like to call the “southern gentleman” bro. I know what you’re thinking: how could “gentleman” and “bro” be used in the same sentence? Although these Rebels have all the makings of a bro, they still learned a little something from Mama about good ole southern manners. Currently the largest university in the U.S., Arizona State has the “Sun Devil” bro. They may be tan, but don’t mistake these bros with Guidos or you could get yourself beaten up. 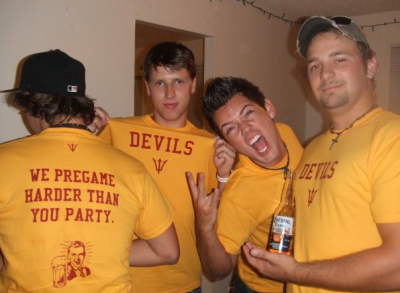 This Tempe, Arizona, university is often described as the biggest party school in the country. Most of the partying here in Tempe is thanks to the amount of bros roaming campus. "The bros who are in the frats here do the whole one-handed half hug and wear the sunglasses with the backwards hat and the tank tops with board shorts, sandals, and are always riding a long board,” said ASU junior Candice Warner. At the University of Delaware in Newark, being a bro does not necessarily mean attending the biggest party school or having the best football team; it is a lifestyle. The bromunnity at Delaware basically runs the school so much you’d think Sperry’s were permanently glued to their feet. They may live in a small state, but their backwards Ralph Lauren caps and general bro can be seen and heard for miles. What’s a bro list without a “beach” bro? Located in Coral Gables, Florida, the University of Miami is where bros can be seen wearing swimming trunks and holding surfboards year-round. Sporting a sunglass tan and skipping classes for the beach, bros at Miami live the epitome of a chill, bro life. The Miami Hurricanes fill the Orange Bowl Stadium for every football game and can be seen having bonfire tailgates on the beach. “Bros here have a frat boy attitude. They wear sunglasses with backwards hats, V-neck T-shirts, boat shoes and board shorts. They have a ton of money and are willing to show it off,” said University of Miami junior Ethan Cloutier. For a sport devoid of bros, check out our Top 10 Schools for Quidditch.